Looking for unique window decorating ideas for the holidays? You can create a different look for every season, holiday, or special occasion using fabric as a cost-effective decorating staple. By using a combination of sheer verticals, drapery panels, and other fabrics to dress up your windows, you can create a window wardrobe that can be used year after year to style your home for each occasion. In this blog, we are going to show you how you can turn your home into a winter wonderland with window decorating ideas for the holidays. ADO provides the perfect interchangeable backdrop for all of your holiday decorating ideas. Watch the short video below for a brief introduction to ADO Fabric’s Drapery Panel & Sheer Vertical Systems. The window fabric line by ADO offers a fabulous assortment of materials and colors that can be mixed and matched according to the season or holiday. 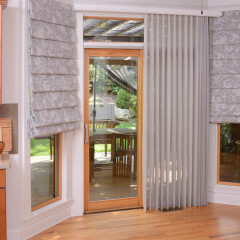 The ADO fabric line for window treatments offers you maximum versatility. The line comes in an appealing array of materials, colors, patterns, and styles, providing you with a virtually unlimited selection of choices. Unlike many window treatments, most of the drapery panels can be quickly removed and washed, which is a convenient feature when you wish to adorn your windows for a special occasion. If you’ re considering bedroom window treatment ideas for the holidays, this is the perfect window treatment system to help you get started. You might use a sheer panel with multi-colored stripes as the backdrop for Christmas or Hanukkah, and use it again for Valentine’s Day or St. Patrick’s Day. One of the most unique features of the drapery panel line from ADO is the split panel effect. This unique system enables you to transform flat fabric into drapery panels by simply snapping each fold into place. The drapery panels may then be drawn in a split fashion that opens up the view of the window behind the panels. By opening the drapery panels to create this split panel look, you create an eye-catching window display for the holidays. A solid panel in a festive hue is perfect for this project – hang the drapery panels in your window, open them to produce the split panel effect, and then hang the decorations of your choice from the top of your windows. Visit our window treatment gallery for more options and ideas on how you can design your window treatments. 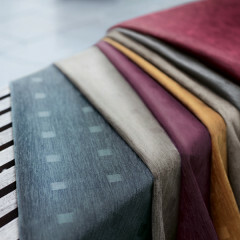 ADO’s auto fabric drapery panel track system provides you with ever more seasonal decorating possibilities. The drapery materials in this line are sewn together to create flat panels. This produces a multi-layered effect that is attractive, versatile, and unique. One complete flat panel might consist of a sheer, patterned fabric in the front and a solid color in the back. 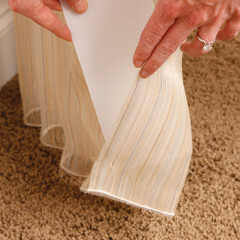 The flat panels are fastened and removed quickly with Velcro, making them an interchangeable accessory for your windows. If you want to divide one room into multiple areas, you might hang a few of the panels across the room (in fabrics that match your holiday decorations, of course). The panels can also be used to obscure the entrance to a pantry or laundry room. They may be moved like traditional panel tracks when hung in windows, but they can also be moved with a motorized feature. 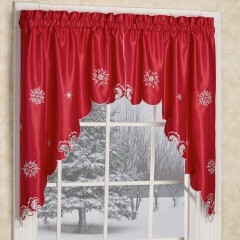 Another fun look can be achieved by using fabric as a valance for the holidays. This may work especially well as an accent to decorative window film and tint. Take a length of gorgeous fabric in your favorite holiday color and drape it across the top of a window that has been treated with film or tint. Then, hang several ornaments in the window from wide lengths of velvet, satin, or canvas in shades that complement the fabric valance. Using this type of valance is also a perfect way to dress up window blinds or window shades for a special occasion. If you’re hosting a baby shower during the winter months, you might use a pastel fabric valance to match the theme of the party. Once the baby shower is over, you can take down the pastel valance and replace it with a fabric valance that complements your décor theme for winter. To accent curtains, draperies, or other vertical window systems, you may wish to incorporate additional fabrics into the overall theme. If you’re having guests over for an Easter party, you could position a table below a window with a fabric valance displayed for the holiday. 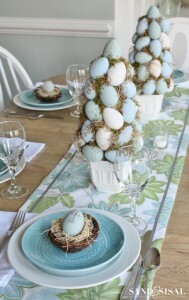 Then, display several fabric eggs and bunnies in pastel hues along the table for an easy an elegant end result. If you’ve hung ADO vertical panels along a sliding glass door for a Thanksgiving feast, you might place fabric gourds or turkeys along the top of the doors. 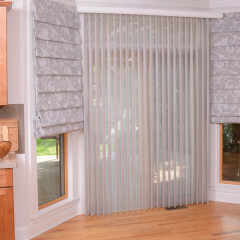 At 3 Blind Mice, we take pride in offering you our extensive line of window treatments – and we want to help you have fun with your window decorating ideas for the holidays!